With an amazing gulf view, a private balcony, the beach and pool at your immediate disposal, what more could you want in a getaway? Walk just a few steps to the beach and enjoy the sugar white sands and emerald green waters. Retreat to the private balcony to relish the golden sunsets over the Gulf of Mexico. Come see the exquisite beaches that are among the most beautiful in the world, right here on Okaloosa Island. Aqua Villa is a four-story, 24-unit condo building directly on the beach. Amenities include a large swimming pool, elevator, common grilling area, grass and fenced area for kids to play, poolside lounge chairs and tables with umbrellas. Because it is a smaller building, it provides a sense of intimacy with its environment of rustling palms, the scent of the gulf waters and the ever-present sound of the surf. Conveniently located close to grocery, restaurants and shops, you won’t need to travel far for supplies or amenities while you vacation on the shore. A convenience store and post office located across the street provide for your immediate needs without even getting in your car. This unit accommodates up to seven persons. Free Wi-Fi, flat-screen wall-mounted TVs in each room. The master bedroom has a California king bed and a private bath with Jacuzzi tub; the second bedroom has a queen and a single bed. A queen sofa sleeper is in the living area. The unit has a modern, fully-equipped kitchen with a breakfast bar. The living area includes a six person dining and coffee tables, couch and chairs. Private balcony is furnished at cocktail height, to enable spectacular gulf views. Plenty of closet and drawer space is available for your personal items. Off street parking and carts make it easy to load and unload your vehicle. 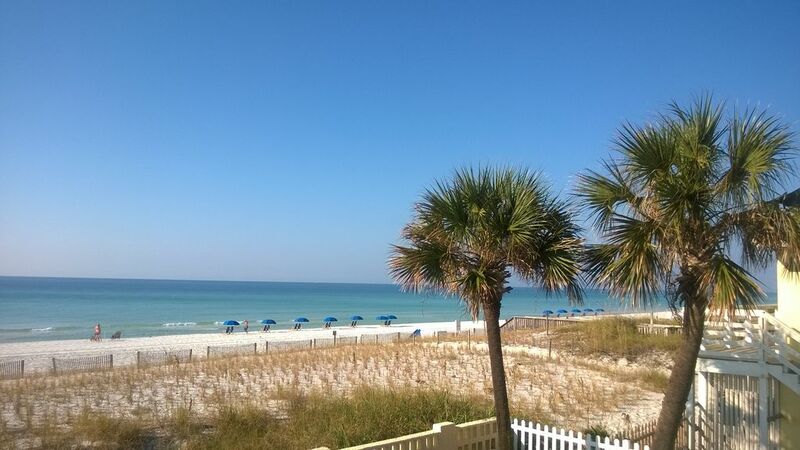 Aqua Villa and Okaloosa Island are conveniently located close to major highways and the Okaloosa Regional Airport. Ft. Walton Beach has public transportation that runs on a regular schedule from the Island to shopping and other local attractions. There is ample shopping close to Okaloosa Island. There are a number day trips you can take to see other sites including Destin, Seaside, and Pensacola, among others. There is any number of golf courses at your disposal. If you like to fish, there are several fishing charter locations for Gulf excursions, inter-coastal and fresh water fishing. Other recreational activities include kayaking, snorkeling with dolphins, parasailing, surfing, boogie boarding, body surfing, sailing, boating, mini-golf, and beachcombing, just to name a few. If you just want to relax, enjoy the pool area or take our umbrella and chairs to the beach (you'll find them in your unit). Aqua Villa is right on the beach where the action and relaxation meet in the most beautiful way. Come see why this is one of the nicest places you will ever find. Even if you only come once, you will always remember the time you spent in this front-row seat to paradise. PET POLICY: While we are pet friendly, note that all dogs must be under 20 lbs. Additionally, dogs must be taken off of the condo property to "do their business". Also note that Okaloosa Island beaches do NOT allow dogs. There are two dog parks nearby that you can take your dogs on the beach. We will provide a complete list of Aqua Villa pet rules to you. My husband and I have been coming here together since our honeymoon in 1994. My folks owned two units, and we bought this condo from my mom in December 2015. Aqua Villa is smaller - just 24 condos total - and you don't need to walk through a lobby to get to the beach. Just walk right out the front door, down a small set of stairs and you're at the pool! (There is an elevator too for when you have luggage, etc). You'll love staying here. The unobstructed view from within the condo is stunning! Directly on beach with easy access from this unit. One each on three floors. It is very easy to access the beach and the pool area from our unit. The steps are nearly directly outside our front door. An elevator is also available with carts for hauling your luggage. Board games, dice and cards. Available for rent on the beach.